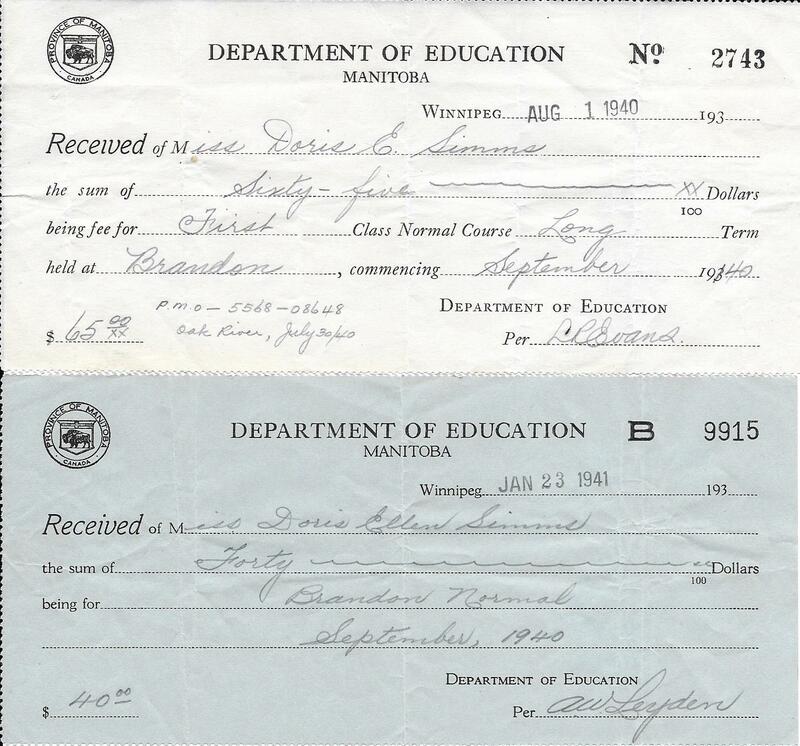 My Aunt Doris Henry was proud of her time at Brandon Normal School and being a teacher myself, I am glad many items remain for me to tell her story. Aunt Dodie, as we always called her, had saved many keepsakes including the framed class photo above where she is shown under the word "Normal". To her left is another former Oak Riverite, Elsie Henry (later Cory), daughter of Charles Henry. I recall her saying she and Elsie "were the cornerstones of the school"! Brandon Normal School began educating teachers in 1912. The history of the term "Normal" seems to be that their purpose was to establish teaching standards or "norms" so that education could be similar from place to place. B.J. Hales was its first principal and continued for the next 27 years. He was instrumental in developing an institution to prepare teachers destined for schools in rural Manitoba. He felt that native flora and fauna were critical parts of the curriculum that country school teachers needed to educate their students and he took a particular interest in developing the grounds of the school to model for future teachers what their own school grounds could mirror. His extensive collection of taxidermy animals and birds is now at the Brandon General Museum and Archives. The two storey structure measured 15.24 by 13.1 metres and was constructed of reinforced concrete with brick walls and tile partitions. Four entrances led to the central octagonal rotunda from where easy access could be made to the various rooms on the first floor. These included two large classrooms with cloakrooms, a laboratory with a large conservatory, reading room and library, general business offices and private suites for teachers. The basement contained a gymnasium, manual training classroom, caretaker's quarters, boilers, fuel and fan rooms and a lavatory. The second floor contained the classrooms, a room for home economics, a museum and a large lecture hall. The exterior finish of the school, simple in design, was constructed of brick with stone trim. In 1943, the building was turned over to the Department of National Defense and in 1946 it became the Department of Agriculture headquarters. Winnipeg became the only Normal School in the province at this time in order to centralize and in 1958 it was renamed the Manitoba Teachers College. 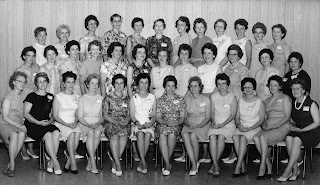 Brandon College brought back teacher training in the 50's. 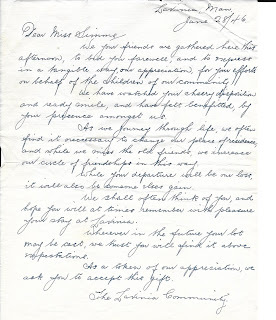 The 1940-41 school year saw Clarence Moore as principal. Miss Yeomans taught physical training "P.T." including a Sports Day at the Brandon Fair Grounds to prepare the girls for the Field Days their country schools would participate in. Miss Pilling instructed in academic subjects as well as sewing and home economics, useful skills to have once the girls found a husband and were discouraged from returning to the classroom. Miss Smith instructed Music and Miss Harrison covered teaching methods, administration and discipline. English, Art, Geography, History,Math, Health, Science - the list goes on. There was also a "Model Room" where students were brought in for practice teaching opportunities under the guidance of an instructor. 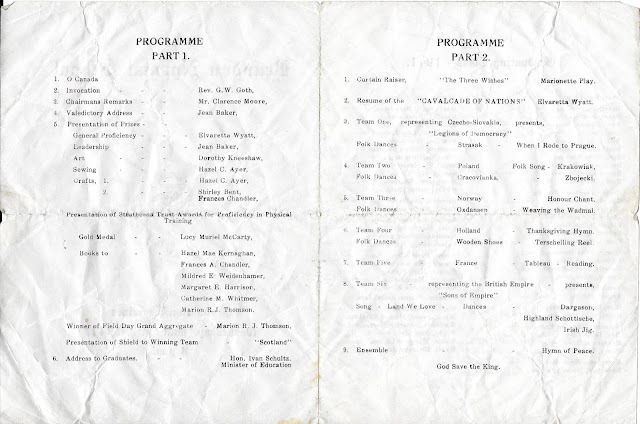 Much of this information came from poems written by Thelma Meadows Davies for the class reunions that Dodie had saved. Dodie kept the receipts for her schooling - $105 for the year. She would have likely lived nearby - room and board, or "light housekeeping" as it was known. 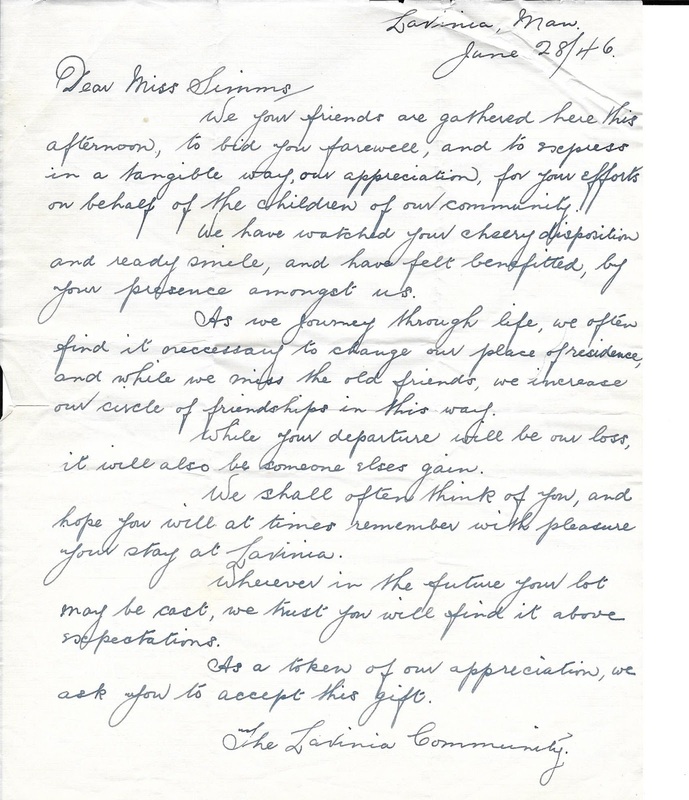 The Class of '41 Graduation Exercises were held on Wednesday, June 25th, 1941 at 8:00 pm where 62 girls were awarded with various medals and prizes and listened to Hon. Ivan Schultz, Minister of Education, address the proud families and the graduates. Marionette plays, folk dances, singing and more rounded out the program that closed with God Save the Queen. It would have been a mix of emotions to be looking ahead with excitement and nervousness but sad to be missing the connections that had been made over the year together. 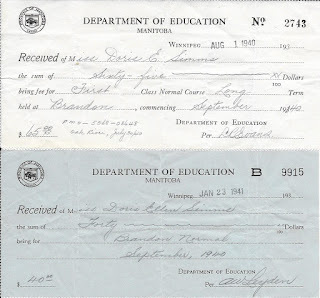 Doris taught in schools at Penrith, White Bank Lea, Strathclair, Neepawa, and Lavinia. The links take you to the Manitoba Historical Society Website information about each school, an invaluable resource for me when writing this blog. 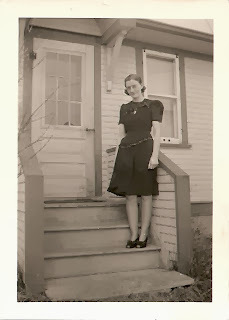 She is pictured below on the steps of Lavinia School and the farewell letter she received was saved with her Normal School mementos. We your friends are gathered here this afternoon, to bid you farewell, and to express in a tangible way, our appreciation, for your efforts on behalf of the children of our community. We have watched your cheery disposition and ready smile, and have felt benefitted, by your presence amongst us. As we journey through life, we often find it necessary to change our place of residence, and while we miss the old friends, we increase our circle of friendships in this way. While your departure will be our loss, it will also be someone elses gain. We shall often think of you, and hope you will at times remember with pleasure your stay at Lavinia. Wherever in the future your lot may be cast, we trust you will find it above expectations. As a token of our appreciation, we ask you to accept this gift. Graduates seem to have felt a real sisterhood and kept in close contact over the years. 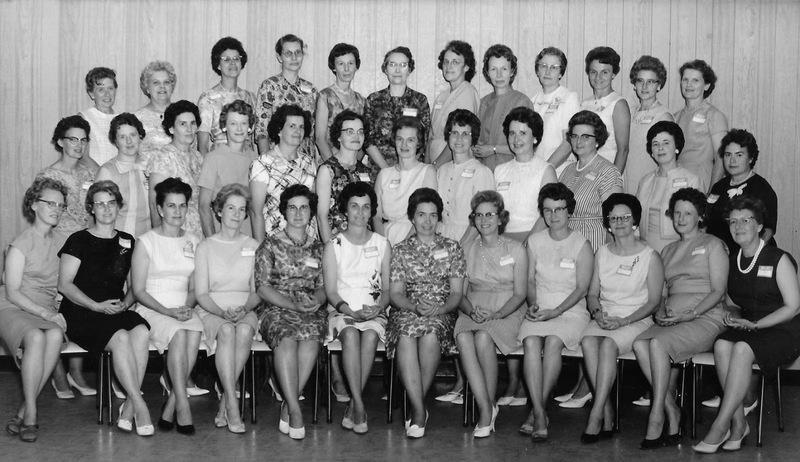 The reunion photo above is dated 1966 and they occurred regularly after that. Dodie is fourth from the right in the back row. Lists of classmates' addresses, married names and reunion location details are part of the envelope of saved items. 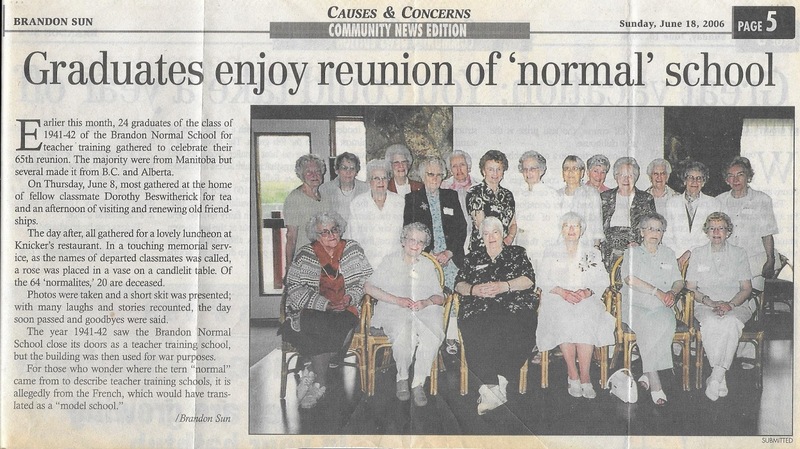 The clipping below from 2006 would be from their 65th and last one Aunt Dodie would attend. She is wearing the blue blazer in the middle row. They seem to be a creative bunch, with poems and skits and other entertainment planned and a determination to stay in touch. I know Aunt Dodie would be glad to have this special group remembered and hope I've given you a picture of their time at "Normal"!